In the north of the Soshi-do hall, there is a tall statue standing, it is the statue of the verenable Nichijo who was the first abbot of Nakayama Hokekyo-ji. 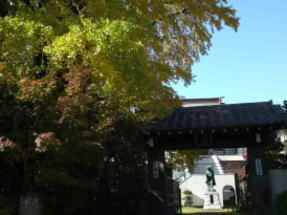 And behind the Ema-do hall that stands on the east side of approch the Soshi-do hall, there is a big ginkgo tree satanding up to the sky is called 'Naki-Icho' (the crying Ginkgo) that also has a legend connecting to the venerable Nichijo and his son. 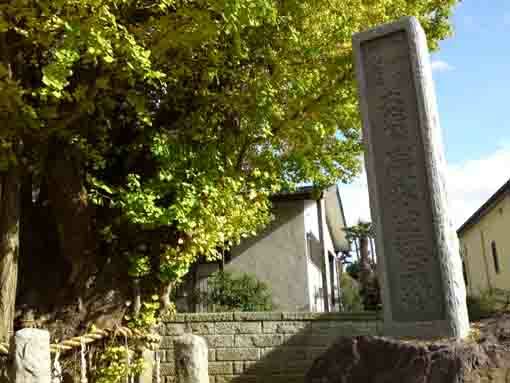 And Next to the ginkgo tree, Komagata-do that he buried his horse there stands, so he dedicated it and built this small shrine. 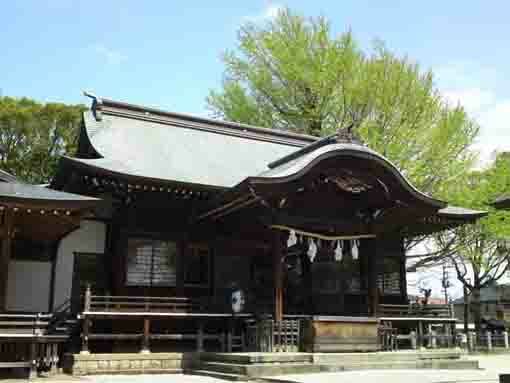 The Founder Nichiren escaped to Nakayama as he met the fire at Matsubagaya, then Jonin Toki (later he became a priest, and he named Nichijo) built the Hokke-do for him, This was the begining of Nakayama Hokekyo-ji Temple. 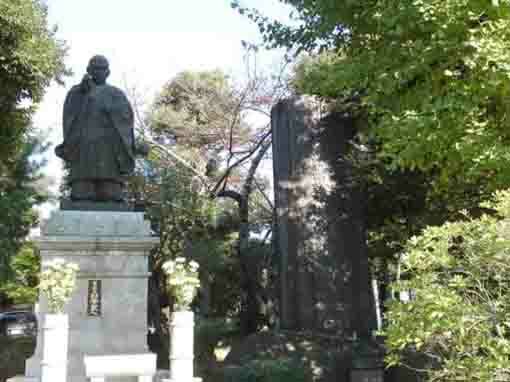 He was given the statue of Kishibojin (goddess of children) carved by Nichiren when he escaped to Nakayama again as he was attacked at Komatsubara. 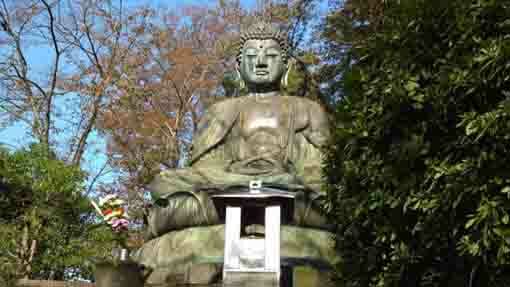 1271 Nichiren wrote to him 'Teradomarigosho'. 1274 Nichiren wrote to him 'Hokkeshuyosho'. 1276 His mother passed. Nichiren wrote to him 'Bojikyoji'. 1277 Nichiren wrote to him 'Shishingohonsho'. 1282 The Founder Nichiren passed. 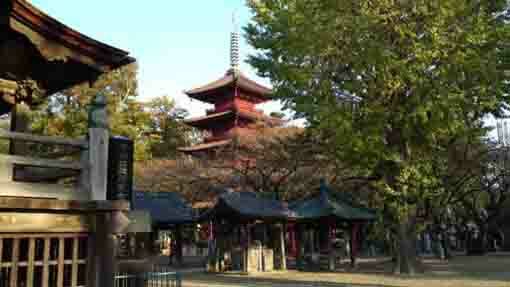 1294 He built Hokke-ji Temple and changed his name from Jonin to Nichijo. 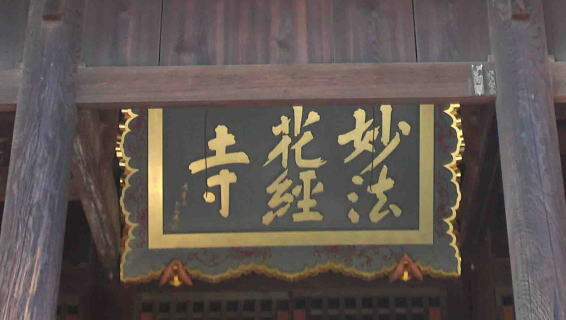 He wrote 'Hioki-no-humi' in March 2nd, 'Nichijo-Shuin-honzon-shogyo-no-koto' (the list of letters and important writings written by the founder Nichiren) in March 6th. In March 20th, he passed at 84 years old. In 1284, the disciple of the founder Nichiren gathered at Ikegami in Tokyo to hold a Buddhist memorial service for the second anniversary of his death since two years after he had passed. Nichiro from Kamakura, Nikko from Minobu, Nikko from Fuji, Nichijo from Nakayama and so many disciples with their supporters and believers came from throughtout Japan. However, Niccho, the son of Nichijo, had not come yet. Niccho was appointed one of 'Roku-rososo' (the six great disciples of Nichiren) by the founder Nichiren himself as leaders to mission. The father Nichijo was worried about him and waited for him impatiently. But it was time to start the ceremony at 2 o'clock in the afternoon, but he didn't come. 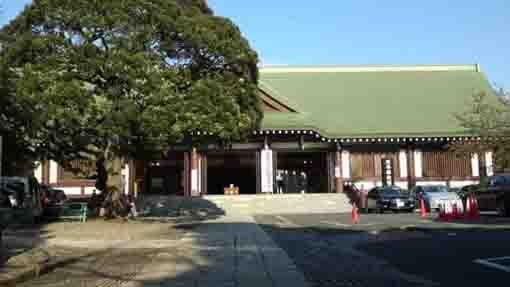 Niccho had a debate about Buddhism with priests belonging to the other sect on his way to Ikegami. Their discussed all day long for three days. Finally, he out-argued them down. Then he delightfully started to walk to Ikegami again. However, it was so late that his father had left for Nakayam when he reached at there. He immediately chased after him to go to Nakayama to beg his forgiveness of his lateness, so he believed that his father would forgive him cheerfully and praised him of defeating other sect. Though Niccho explained the reason, the father said that he could discuss anytime you like, but the day of the second anniversary would never come. The father scolded his son that it might be his ingratitude to his master Nichiren since he had not attend the ceremony on time. Niccho deeply examined himself. 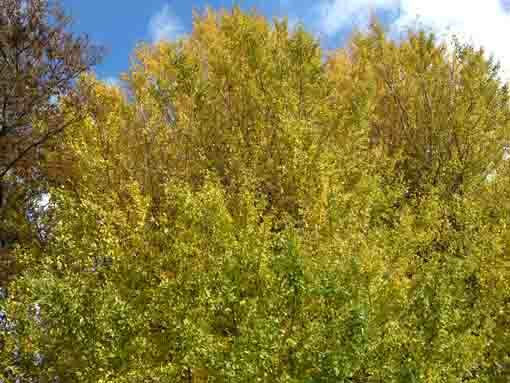 And he chanted sutras with tears while walking around and around a ginkgo tree to beg his forgiveness. Though he chanted the repentance for seven days with his crying, his father did not forgive him. Finally, Niccho disappeared. 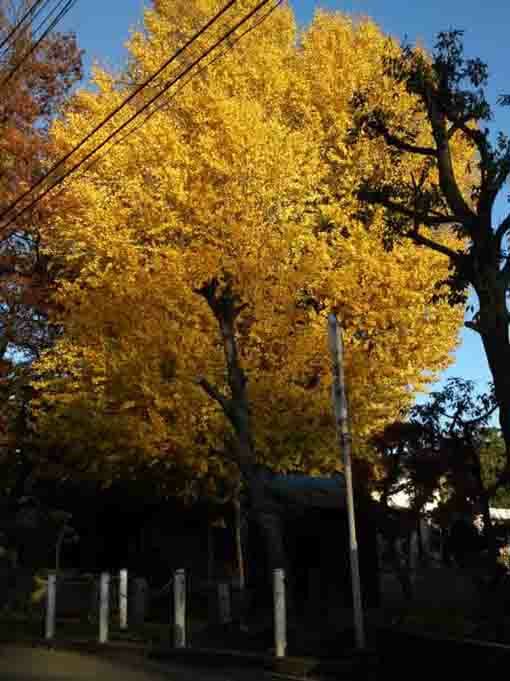 This is the legend that the gingko tree behind the Ema-do is called 'Naki-Icho' (the crying gingko tree). 17 years had passed, Niccho heard that his father fell into critical condition. He immediately rushed to Nakayam and begged his forgiveness, but the father did not. Nichiro, one of the Roku-Rouso (the great disciple of Nichiren) was touched with pity for them, he asked Nichijo to forgive deeply regretted his son. 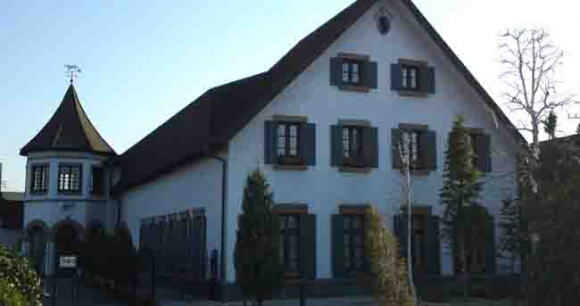 However, the father said that it would be an instruction for supporters and believers in future to tell how the anniversary of their masters and parents would be important. Nichiro understood the father's heartbreaking thought. The father did not see his son anymore again. Niccho held his father's shirts and cried outside of his father's room. He heard from his younger sister that the father passed. Niccho could had not seen been forgiven for whole his life. After that, he went to Mt.Fuji to live in seclusion, and he never came out of. This story is not only to tell how important the Buddhist service for the founder Nichiren is, but also to give the instruction to hold the anniversary services for ancestors. Don't forget your ancestors and those days for their anniversaries. The statue of Nichijo and Naki Icho Gingko Tree in Hokekyouji Temple have great accessibilities from both Narita and Haneda International Airport. 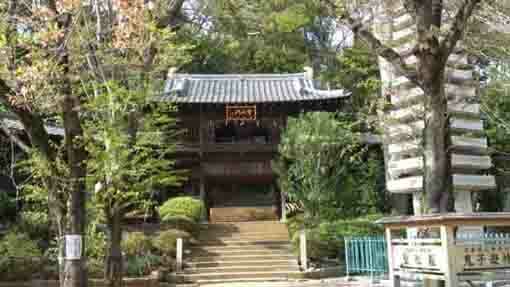 The temple has the story about the samurai worrier in middle age Oguri Hangan.